Search for the Dwemer's Aetherium Forge. (Optional) Retrieve the unique bow Zephyr. Locate and retrieve the four Aetherium Shards. Locate the Aetherium Forge inside the Ruins of Bthalft. Choose your reward: the Aetherial Crown, Aetherial Shield, or Aetherial Staff. 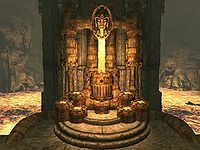 In ancient times, the Dwemer constructed four city-states led by the great research center of Arkngthamz in the Reach. Their purpose remains unknown, but the city-states were undefeatable and held their ground against attacking Nords for centuries. Then, in the midst of the First Era, all four city-states suddenly collapsed within three years. The Nords ascribed the destruction of the cities to the strategic genius of High-King Gellir, but many scholars suggested that the cities fell for other reasons—although the mystery was buried along with the cities and merely forgotten. The Aetherium Wars is a tome written in the present day by Taron Dreth which details the fall of the four cities and even offers an explanation for the downfall of the Dwarves: namely, Aetherium, an ultra-rare crystal-like matter with a strong, magical aura. 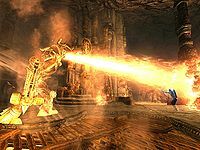 The author suggests that the Dwarves found a considerable amount of Aetherium and started experimenting with forging it into weapons with a newly constructed "Aetherium Forge". Due to their brilliance, the Dwemer actually succeeded. The weapons created were so powerful that the strong bonds between the four city-states shattered, as everyone wanted to have access to the Forge, with subsequent conflicts weakening the cities enough for them to be an easy conquest for Gellir. The book ends with a challenge for the adventurer: "But nothing like the Aetherium Forge described in the inscriptions has ever been found within the borders of Skyrim. It may have been destroyed long ago, by the Nord invaders or the Dwemer themselves. Or perhaps it, like the secrets of Aetherium itself, still remains to be discovered." As soon as you open the book, an objective will be added to your journal, encouraging you to investigate Arkngthamz, a Dwemer ruin located down the path from Dushnikh Yal. As you approach the entrance, the earth will quiver underneath you, hinting at things to come. A few feet into the ruin, the whole place will shiver, and an unidentified female voice will echo through the halls, saying: "Please, turn back... before it's too late..." Follow the tunnel to a very large chamber and look around for a bit. Before long, a ghost will appear and actively seek you out, asking you if you are there for the treasure. When asked, the ghost will reveal herself as Katria: "The name's Katria. I am - was - an adventurer. Raided ruins like this for nigh on twenty years. I was on the trail of something big. It led me here, and... I didn't make it." When you point out the familiarity of her name, she will reveal herself to be the Katria to whom the book The Aetherium Wars is dedicated, although she will angrily add: "That was my theory, you know. My research. My life's work. All of it, lost! Stolen by my own damn apprentice! That's how I ended up here. I can't rest. Not until I find the Forge, until I can prove that it was my discovery. Mine, not his!" She will then tell you that she died in Arkngthamz and will warn you once again. You can then persuade her or choose to be friendly or hostile. All three opportunities will lead to Katria giving up and offering her help in guiding you through the ruin. As she obviously knows her way around, there is no real reason to reject her offer, so bring her along. This will finally initiate the quest and you have a long trek before you. "...this is where I ended up. It was... quite the fall." Take another look around and get familiar with the place. The clear blue sky is visible above, along with several ledges, while a waterfall feeds an underground lake below. When asked about the state of the place, Katria will tell you that a huge earthquake hit the ruin and destroyed everything, killing her in the process. She will also mention what's ahead of you: "Well, there's the Falmer, to start with. Deadly rapids. Major earthquakes. Massive chasms. Unstable ground. Lethal falls. And then you get to the real danger. We can discuss that when the time comes. If it comes." Just above the water is a small ledge with a dead body. Use the fallen pipe to reach the ledge and you will find that it is Katria's body. Katria will sadly comment: "...this is where I ended up. It was... quite the fall." She will then ask you to grab her journal from her body. Pick up Katria's journal and search the underground area for a Dwemer chest. From the ledge, head west, past a dead Falmer. As you make your way through the tunnel, two Dwarven spider workers will jump out of the pipe in the ceiling and attack. The next room is flooded, with an unlocked chest underwater in a corner, but another pipe makes a convenient, although narrow, bridge to the northwestern passageway. At the end of the tunnel is a door opening and closing and, behind it, a strange device. Once again, Katria will be helpful: "See that thing? Dwarves called them 'Kinetic Resonators'. Don't see them very often, least not among the clans in Skyrim. Just hit them, and they'll... do whatever it is they're supposed to do." Locate the second resonator and hit it with your weapon or a spell. The northern doors will swing open and reveal a staircase leading up. Before long, you will arrive in the central chamber, on one of the ledges above your starting point. Kill the Falmer enemies and keep an eye out for two chests. Proceed upstream along the waterfall using the tiny ledges and bridges and kill all the Falmer you meet. When you reach the top, the bridge will turn into a narrow passageway in the stony wall. 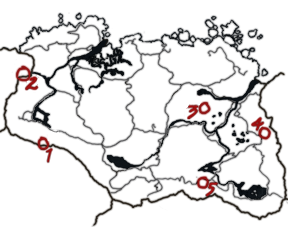 Beware of the next chamber and watch your health, as you will be attacked by numerous Falmer, chaurus, and chaurus hunters. At one Falmer camp you can take a detour for a bit of extra loot by heading left through a gate to the southwestern passage that leads to the top of the waterfall and a chest to its left. But your target tunnel is the one to the northeast. It leads to a naturally lit cavern, with huge trees reaching towards the blue sky. However, a huge hole in the center, with your starting point a long way below, hints at the destruction caused by the earthquake. A sad Katria will confirm it: "Here's where I fell. Feels like ages ago." She will, however, cheer up when she spots one of her old belongings: "Hey, there's my bow! There, out on the log. Wondered what happened to it." The bow is the unique Zephyr, one of the fastest bows in the game, so carefully approach and claim it, while making sure not to take the same fall as Katria. 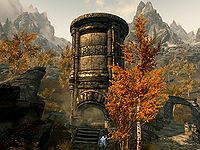 Locate the northeastern slope and proceed forward until you reach the summit of the ruin, a very large chamber with a huge Dwemer construction to the north, seemingly the best preserved part of the city-state of Arkngthamz. A huge task is obviously ahead, and all Katria will say is: "Here we go." "See the Resonators up there?" Unleashes four Dwarven spider workers. Triggers the two Dwemer ballistae under the ceiling. From that point forward, the ballistae will reload and fire. Place yourself in front of the construction and look at the two drawings. The first three Resonators are easily discernible from the journal and the scrap of paper, but the last two are unknown. You can experiment yourself, or click here for the solution. Once you have hit the right combination, the two side doors will swing wide open and you will have access to the treasury of Arkngthamz without interference from the imprisoned Centurion. 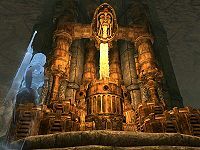 In the hidden room behind the Tonal Lock, you will find plenty of Dwemer scrap metal, a few Dwarven metal ingots, and the biggest treasure of all—the Aetherium Shard, located on a small podium. When picked up, an overwhelmed Katria will say: "Let me see it. ...Huh... What? What is this? Look, on the edge here. This has been cut, precisely cut. If you had another piece, about the same size, it would... it would snap right in. I saw a drawing of this once. This shard... it's... it's part of a key. A key made of pure Aetherium! The key to the Forge!" She will then explain what needs to be done: "We have to find the other pieces, of course. There should be, hmm... three more. One for each of the four cities that worked on the Forge. I had a map, in my journal. That's where we should start." She will, however, realize the size of the task at hand: "We still have to find the Forge itself. I had a lead on that, too. There's so much to do. I'm going to head out and start tracking things down. We'll meet again, I'm sure of it. For the first time in a long while, I think I - we - may actually be able to do this. And... and I owe it all to you. Thank you." She will then disappear and leave it to you to loot the chest behind the pedestal for a boss-leveled treasure and find your way back to the entrance. The easiest way is to locate the small tunnel in the water in front of the Tonal Lock, then make your way to a small ledge above the huge main chamber where you met Katria for the first time. You will need to make a running jump to clear some rocks and hit the water. If you are unable to do this then the Whirlwind Sprint or Become Etheral shouts will help; if these are unavailable, then you will need to walk the long way back to the entrance. When you surface from Arkngthamz, up to three map markers will have been added to your map if you've already discovered those locations, matching Katria's scribbling in her journal and the number of shards still in need of uncovering. You will have no choice but to travel to all three destinations, in no particular order. Katria will have numbered each spot on her own map in the journal, along with some quick thoughts, so it's worth reading through. Mentioned as a 'Bthar-zel' ('allied city'?). Not Bthardamz, though. This is located just north of Bthardamz, specifically a landmark known as Deep Folk Crossing, a bridge over a waterfall with two watchtowers of Dwemer architecture. Head north up the hill from the bridge and you will find a large podium, with yet another Dwemer Convector. Placed on the other side is the Aetherium Shard. When you pick it up, Katria will appear and thank you, then disappear once again. The primary source of Aetherium. Extracted from some deeper mine? The shard here is in the huge Dwemer ruin of Raldbthar, which is located between Lake Yorgrim and the White River, southwest of Windhelm and almost directly east of Shearpoint. Members of the Dark Brotherhood may have visited the ruin beforehand as part of the quest Mourning Never Comes (if not, see this section for potential bugs), as it is the hideout of infamous bandit leader Alain Dufont. The Aetherium Shard is located at the very end of the ruin in Raldbthar Deep Market, so get ready for a long trek. NOTE: Even if you have already cleared the ruin, the elevator may be shut tight due to the exterior cell re-spawning after 10-30 in-game days. As a result, no easy access will be available to the final chamber of the ruin and you will have to go through it all again. Jump up to the elevator and see if it is accessible; otherwise, click the show button to the right for a full dungeon walk-through. Dispose of the three bandits guarding the exterior area and enter through the main gate. Down the tunnel will be another bandit, ready to go to sleep on one of the bedrolls, so approach carefully and kill him. At the next intersection, the residing bandits have made good use of a constantly burning flame spout trap, cooking a charred skeever in the flame. 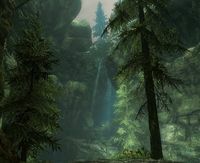 You can either dodge the trap and proceed straight ahead or take the longer route to the east; the latter option will net you several more encounters with patrolling bandits but will also provide an opportunity to kill Alain Dufont and his companions with the lever-operated Dwemer ballistae on the ledge above their camp. In either case, open the gate southeast of the camp and search the next room for the Sneak skill book 2920, Last Seed, v8, right above a locked Dwemer chest. The southwestern corner has a master-locked gate blocking a bit of worthwhile treasure, while your target is behind the huge door to the southeast. Follow the corridor as it twists and turns, then open another set of doors into a huge chamber guarded by numerous Dwarven spiders and spheres. Use the oil on the floor to your advantage, then proceed southwest. Around the next corner, beware of the two sets of spinning blades and dodge them as you move up the slope. Next up is a huge chamber in two levels, with a flame spout trap and a sphere. Head up the stairs and fight another sphere, then follow the oil slick to yet another set of stairs. Take the tunnel leading northwest and fight two spiders before pulling the elevator handle that will take you to the next area, Raldbthar Deep Market. 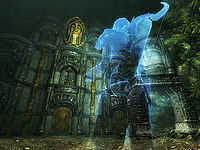 In the Deep Market, the surroundings have changed considerably, hinting at the ruins' connection to the Dwemer city of Blackreach. Head down the dark slope and avoid the spinning blades by hugging the walls. Open the door to a large chamber in several levels, crawling with Falmer enemies, skeevers in cages, and dead humans. Make your way to the stairs leading up, then follow the slope to the huts. Up there, a bridge leads to a platform in the northeast; cross it and kill the Falmer. Activate the button on the table behind the tent and watch the bridge lower on the central platform. Backtrack and cross the now-lowered bridge to proceed into a small tunnel, only to re-emerge in the same chamber. Making sure not to fall off the edge, cross the rooftops until you find an opening in the grate. Find the narrow tunnel leading west, then south. You will meet a few Dwarven spiders here, along with a pressure plate triggering a deadly explosive bolt from the Dwemer ballista on the adjacent platform. Make your way through lots of steam and pipes and beware of another pressure plate triggering a claw trap. The steam also hides a spider and sphere. Head to the big northwestern door and open it. Up the slope are four buttons placed next to each other. Only two of them still work. The first on the left will trigger two flamethrower statues, while the third from the left will lower the portcullis blocking your way through the western tunnel. Open the door and face the final chamber of the Deep Market. Four Falmer enemies will be lurking around the many tents, while several chaurus can be heard rattling in a closed pen to the south. Make your way west towards the pond with the broken machinery. The noise indicates that the wheels are stuck, so remove bones, skulls and spines from the wheels so they can work properly again, including the scrap stuck in the wheel underwater. When everything runs properly, stand on the bridge and press the button to see the bridge lower. No escape yet, as the lowered bridge reveals a leveled Dwarven centurion. After fighting it off, loot the chest where the Centurion rested, then open the door. Follow the tunnel and pull the lever. Kill the three spiders and a sphere then head into the northeastern chamber to claim your Aetherium Shard. The elevator leading up can be found to the southwest, so hear what Katria has to say, then ride it up into the fresh air. A storage site for raw Aetherium, just outside a major city. 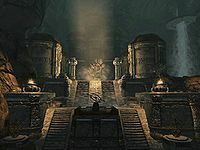 A few feet south of the gigantic Dwemer ruin of Mzulft sits a smaller building named Dwarven Storeroom. Inside, you will see Katria standing in front of a locked door, who will ask for help prying it open. However, another door to the southwest has an apprentice-leveled lock and leads to a small room with several ingots and two minor loot chests. At the end is another door leading left, also with an apprentice-leveled lock. Pick it and enter the room Katria initially wanted to enter, and claim the Aetherium Shard on the podium. Katria will appear and thank you, then disappear again. Once you have claimed all four shards, an excited Katria will tell you to meet her at the Forge, although it is unclear where the Forge actually is. Fortunately, she marked the location on your map (based on location 5 from her own map), so travel to the small Ruins of Bthalft southeast of Ivarstead to meet her again. As foretold by her journal, the altar here has an astrolabe on top and space for a round object in the middle. When you arrive, Katria will seek you out and say: "You made it! And you've brought the shards! She will then tell you to check out the device: Look at the device here - the gear in the center is just about the right size. Try putting the shards in and... we'll see what happens." Obey her orders and activate the Dwemer Mechanism, and watch while the shards turn into a perfectly round Aetherium Crest, although nothing else will happen. Katria will suggest moving the finished crest from the device; do so and then keep your distance from the mechanism, as the earth will begin to tremble heavily underneath you. Before long, a huge tower will shoot up from the ground, revealing an entrance with a handle in the middle. Katria will head on inside, fascinated with the uncovered secret, so follow her and push the handle to take the elevator a long way down. "The air here... it feels different. Almost like..."
The elevator stops deep underground, and even Katria will express a bit of concern, claiming that nobody has been down there for thousands of years. Examine the boulders to the east for a locked chest. Pull the handle next to the northern gate and two gates will open. The eastern gate has a path that circles around to an apprentice level chest. Return to the gate room and go north to enter a small chamber where a brazier automatically activates, casting light over a cave-like structure. Stay on the path and the braziers will help you along. Cross a bridge to reach a small altar filled with Dwemer gear and scraps. Katria will estimate the place to be 4000 years of age. Head west over the next bridge to a huge stairway leading up between several smaller buildings. The braziers will keep the path lit up, and you will come across yet another astrolabe. At the top of the stairs stands a tree, almost completely yellow, and is obviously dead and frozen in time. As you approach the western gate, Katria will say: "Door's shut tight. I bet those Resonators would open it, though. ", pointing your attention to the two resonators above. There is also an entrance into the cliff, but that will lead you downstream and into the water you traversed by bridge before. Hit the two Resonators with a ranged weapon or spell and the gate will open, and the lights will be turned on one-by-one in a lengthy underground tunnel. Everything appears to be fully functional and Katria will comment: "The air here... it feels different. Almost like..."
The Forgemaster attacks Katria with its fire breath. Behind the next door sits a huge construction, although most of the room is covered in steam billowing up from the floor. You will lose health if you go through the steam, so pay attention to the platforms in the eastern and western corners. Get up on one and activate the steam valve, which will cause half of the steam to disappear. Get over to the other and turn the valve to dissipate the steam entirely. Unfortunately, the entire place is booby-trapped and before long, numerous Dwarven spiders will jump out of the many tubes, and they keep coming until four Dwarven spheres join in. In the middle of the battle, the steam will be turned back on, leaving very little space to fight, so jump back up and turn off the steam if you can. When all four spheres have been dealt with, a sudden noise can be heard from the lava, and a gigantic centurion named The Forgemaster will surface and immediately spray blasts of liquid fire at you. This can be a tough battle, but Katria will prove worthy and can quite easily deal with the Forgemaster herself. Once he is on the ground, you can behold the Aetherium Forge in all its glory, finally rediscovered after 4000 years. An excited Katria will rush up to you and yell: "I... I almost can't believe it. We did it! We actually did it! There's only one thing left to do. We have to prove this actually works. That this is the real Aetherium Forge." Katria beholds the Aetherium Forge. The Aetherial Crown is a circlet that allows you to use two standing stone abilities simultaneously. The Aetherial Shield is a heavy shield that makes enemies become ethereal (unable to attack or be attacked) for 15 seconds when shield-bashed. The Aetherial Staff is a staff that summons a Dwarven spider or Dwarven sphere for 60 seconds. Once you have used the Forge, Katria will bid you farewell: "And with that... it's done. No one could possibly deny what we've found now." She will then start to fade, saying: "For me? I've done what I set out to do. But you... take that out into the world. And if anyone asks, tell them what we discovered. Together. And now... I think I can rest. Farewell, my friend, wherever your travels take you." Before she disappears completely, she will kneel before you, respectfully. Meanwhile, the author of the book, Taron Dreth, will be wandering the wilderness of Skyrim with his band of personal mercenary guards and claiming to be the world's foremost expert in Dwemer metallurgy, based on the research that he stole from Katria. If you run into him while wearing or carrying the unique Aetherium item that you made, Taron will immediately realize that his fraud has been called and will aggressively run up to you, saying: "Your crown/staff/shield... gods, it's made of Aetherium! Pure Aetherium! Where did you find it? Tell me!" He will then demand the artifact so that he can keep his secret safe. Regardless of your answer, you will get revenge on behalf of Katria, as Taron will see no other option but to claim the artifact from you with the words: "Then I'll take it from your corpse!" He and the three mercenaries will then attack you. He is a very powerful elemental mage and can be quite challenging, but in the end, the only thing left to tell the tale of the four Dwemer city-states and the rare, luminescent crystal will be the tome The Aetherium Wars. The shards will spawn once Dawnguard is installed, even before the quest is active. Should you come across one of them, it will be labeled "Glowing Crystal Shard", and taking it will trigger a miscellaneous quest to "Identify the Crystal Shard" as well as conveniently spawning a dead adventurer with a copy of The Aetherium Wars nearby. Reading the book will prompt you to visit the ruins of Arkngthamz as usual and rename the Aetherium Shard as such. Even if you decide to leave Katria behind at the entrance of Arkngthamz, she will reappear later on in front of the Kinetic Resonator puzzle. If you take Katria's clothes when you examine her corpse for her journal, she will comment about her lost dignity. If you have already found one or more of the other shards, then there is an extra dialogue option to inform Katria of this before she heads off to find the other shards. The quest proceeds as normal otherwise. The map markers for the various shard locations will only appear once you approach the relevant location. It's possible to have markers appear without having a location icon if you've traveled very close to the location without actually discovering it. Katria can be made into a permanent follower by speaking to her at the Tonal Lock gate then immediately leaving the ruins via the waterway tunnel (left of the Tonal Lock gate). This makes the Tonal Lock gate glitch so that it will not open however this can be bypassed by using plates to Windsprint through it if you wish to continue the quest at a later point. Katria's gear can be changed at the start of the Lost To The Ages quest by canceling out of her initial conversation then using Ice/Paralyze/Force as she walks away to perform a reverse pickpocket. Her bow cannot be upgraded however. 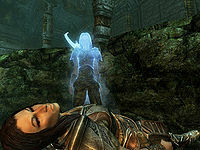 This quest may not start if, after installing Dawnguard, you have visited Mzulft or Deep Folk Crossing prior to reading The Aetherium Wars and the corpses at these locations have been fully removed from the game. After forging either the crown, shield, or staff at the forge, the quest may not update and you will remain trapped in the room with the forge as the stairs won't come back up. Use setstage DLC1LD_Bthalft 90 in the console. Activating the Forge may place the Aetherium Crest in it, but without opening the Forge menu. The lever to operate the lift to enter the Forge may not appear, making it impossible to complete the quest. When speaking to Katria after discovering the entrance to the Aetherium Forge, she may disappear, and you will not be able to open the first door within the Forge. Katria's journal may be nowhere to be found. However, it is not required to complete the quest. Reading The Aetherium Wars may not add the miscellaneous objective "Investigate Arkngthamz" to your quest log. Upon investigating Arkngthamz, "Lost to the Ages" may not be added to quest log, either, meaning that you will be unable to complete the quest. A way to fix either bug above is to reload a save in which you have not started the Dawnguard questline, then drop The Aetherium Wars and any crystal shards if you have obtained any, and pick the book back up and read it. The quest should start, and then you can pick up the shards. You may not be able to place the shards in the Dwemer mechanism at Bthalft. The doors may not open even after hitting all five Resonators in the correct order. This can be fixed by hitting the wrong Resonator first, defeating the enemies, then hitting the correct order. Alternatively, reloading a previous save may work. If this doesn't work, try turning off your system, reloading your save file and dropping the Zephyr Bow back on the log where it was found. Then proceed to the Resonator and continue as normal. A save prior to entering Arkngthamz may resolve this issue, as it may be caused from loading a save file made in Arkngthamz during the quest. One could attempt to complete this portion of "Lost to the Ages" by saving before entering Arkngthamz and making one good run of it, from start to end, without relying on a back-up save mid-dungeon. If you leave Raldbthar before getting the shard, Katria may become unresponsive and the shard will not update the quest when picked up. ? The shard in Raldbthar may be called 'Glowing Crystal Shard' instead of an Aetherium shard, and picking it up does not update the quest, making the quest impossible to complete with a 'missing' shard. Console commands to advance the DLCLD_Misc do not work either. Pick up the shard in Dwarven Storeroom last to fix this problem. 100 In Arkngthamz, I met Katria, the ghost of an adventurer who perished there. She offered to join me in my fight to the summit, and I accepted her help. 111 In Arkngthamz, I met Katria, the ghost of an adventurer who perished there. She warned me that the Treasury of Arkngthamz was sealed by a dangerous Tonal Lock and protected by deadly traps. 112 In Arkngthamz, I met Katria, the ghost of an adventurer who perished there. We made our way through the ruins and reached the summit together. There, she warned me that the Treasury of Arkngthamz was sealed by a dangerous Tonal Lock and protected by deadly traps. 120 In Arkngthamz, I met Katria, the ghost of an adventurer who perished there. With her help, I solved the Tonal Lock that protected its ruined treasury. 125 In Arkngthamz, I met Katria, the ghost of an adventurer who perished there. With her help, I solved the Tonal Lock that protected its ruined treasury and found a strange glowing crystal shard within. 126 In Arkngthamz, I met Katria, the ghost of an adventurer who perished there. With her help, I solved the Tonal Lock that protected its ruined treasury and claimed the Aetherium Shard within. 130 In Arkngthamz, I met Katria, a ghost searching for the mythical Aetherium Forge. Together, we found one of the four Aetherium Shards that make up the key to the Forge. She left to search for the other shards and the Forge itself, and urged me to do the same. 150 In Arkngthamz, I met Katria, a ghost searching for the mythical Aetherium Forge. With her help, I found the four Aetherium Shards that make up the key to the Forge, and now seek the entrance to the Forge itself. 160 In Arkngthamz, I met Katria, a ghost searching for the mythical Aetherium Forge. With her help, I found the four Aetherium Shards that make up the key to the Forge, and met her outside its long-sealed entrance. 190 In Arkngthamz, I met Katria, a ghost searching for the mythical Aetherium Forge. With her help, I found the four Aetherium Shards that made up the key to the Forge, and combined them to reveal the entrance to a long-sealed ruin. 200 In Arkngthamz, I met Katria, a ghost searching for the mythical Aetherium Forge. With her help, I found the four Aetherium Shards that made up the key to the Forge, then confronted its ancient guardians. 210 In Arkngthamz, I met Katria, a ghost searching for the mythical Aetherium Forge. With her help, I found the four Aetherium Shards that made up the key to the Forge, then defeated its ancient guardians. 225 In Arkngthamz, I met Katria, a ghost searching for the mythical Aetherium Forge. With her help, I found the four Aetherium Shards that made up the key to the Forge, defeated its ancient guardians, and forged a powerful artifact. DLC1LD: 0, 1, 2, 3, 4, 5, 6, 7, 10, 20, 30, 40, 50, 70, 71, 72, 73, 74, 75, 140, 141, 142, 143, 144, 145, 146, 147, 148, 175, 179, 180, 182, 185, 186, 187, 196, 206, 221, 255. On the PC, it is possible to use the console to advance through the quest by entering setstage DLC1LD stage, where stage is the number of the stage you wish to complete. It is not possible to un-complete (i.e. go back) quest stages, but it is possible to clear all stages of the quest using resetquest DLC1LD. This page was last modified on 27 January 2019, at 18:05.